At the end of the day, the person responsible for ensuring ALL requirements are met is the one doing the installation. 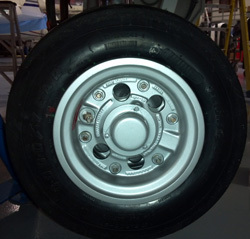 Within the last few weeks at Duncan Aviation, we’ve had discussions about tire changes on Learjets and other make/model aircraft and what criteria to use when replacing a tire. It sounds pretty simple, but there is a lot of confusing and conflicting information you should be aware of. There are aircraft maintenance providers that will replace your tire using only the Component Maintenance Manual (CMM) and have the 8130 state that as their only reference data. But when was the last time you looked in your aircraft maintenance manual (AMM) to confirm that this met all the stated requirements? The AMMs for Learjet 31, 35, 36 & 60 series call out the replacement of ALL the self-locking nuts when re-assembling the wheel halves. Yet the 20 series and 55s do not, at least not at this time. I would be surprised if this is not changed in the next revision. Are you aware of what criteria were used on your last tire change? There is one P/N wheel and tire assembly that can be used across more than one model line. During your last tire change, if only the CMM was referenced and this assembly was installed on your Lear 31, it is possible it does not meet the airworthiness standards for your aircraft since the CMM does not state to replace all the self-locking nuts on every tire change as it does in chapter 32 of the AMM for that model. Also note, we have seen other OEMs place other requirements such as eddy current and Chapter 5 Requirements on wheel and tire assemblies over and above what the CMM calls out that are installed on their aircraft. At the end of the day, who is responsible for ensuring ALL requirements are met when installing ANY part on an aircraft? That’s right… the one doing the installation. In most cases, that is probably YOU. When contacting Duncan Aviation's Accessories Department to send a wheel and tire assembly in for a tire change, please state which aircraft maintenance manual you would like us to reference to ensure we comply with all the requirements that you, as the installer, will need.